I’m so thankful that my mom taught me to sew. When I was growing up I would always have to call her over to thread the sewing machine for me, because I could never remember how to do it between sewing projects. But her perseverance paid off, and now I am a fairly competent seamstress. 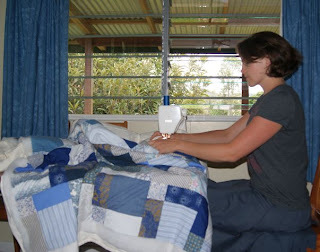 Quilting is a new hobby, but I haven't had time for that lately. My sewing has fallen along more practical lines. I’m no tailor, but I can do basic repairs and alterations, which has come in very handy here in PNG. 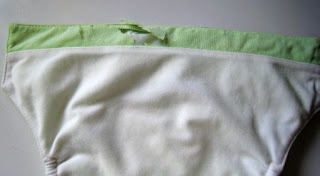 Consistent use and washing will tell how well the repair holds up, but I’m hopeful. 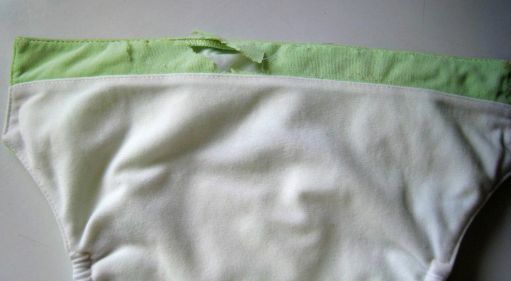 It’s not ideal, since it makes the inside pocket one inch smaller, but it seems like the inserts will still fit. I admit I was really bummed that these haven’t lasted longer. I don’t know if I got a bad batch, or if it’s the way I launder them or hanging them out in the hot tropical sun that does it. I had hoped they would be useable for another baby, but now it looks like I’ll be trying to make them last until we get back to the States or until Greg is potty trained, whichever comes first. 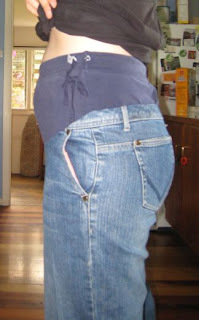 To make the maternity panel in this pair of jeans, I cut out the waistband of an old pair of stretchy workout pants that I’ve had since college. These jeans had a broken zipper, so they were perfect for the project. This skirt is another piece of clothing that has been with me for a long time. I’m pretty sure I owned it before I knew Brian. It used to be ankle-length, but last year I shortened it. Now I altered it again, and voila! 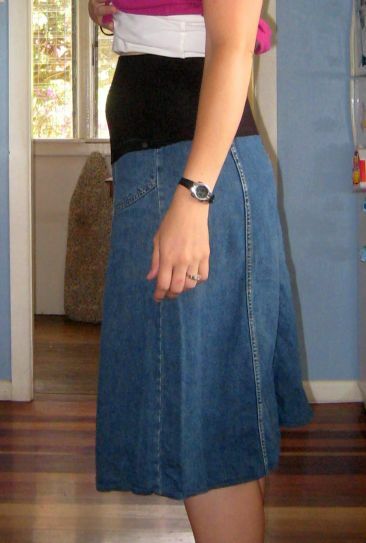 A maternity skirt. For this one I used a pair of maternity leggings that I found at the secondhand store for about 50 cents. The only sad thing about this alteration is that I had to sacrifice the pockets to make it work. Good skirts with pockets are a valuable possession when you’re a missionary. What is the big pit for?